it’s always the same, it’s just [a] shame. Yesterday night I had the privilege of hearing a couple speak about their love story. It was truly beautiful to hear how God had redeemed two broken people and brought them together to glorify Him. They talked about staying pure and their boundaries. I didn’t agree with everything they said as a general rule but I realized that these boundaries were right for them (perhaps even right for me…only time will tell). Towards the end of the night the woman asked the single women in the room who wanted to be in a relationship to stand so she could pray for them. I remained seated. She looked at me and asked what was wrong and prompted me to stand. I tried to shrug it off and motioned for her to begin praying. She again prompted me to stand. I did not want to offend anyone. I wasn’t trying to call attention to myself. But in that moment I knew I had to stand firm. Half-jokingly I said “well, what if you’re perfectly happy to not be in a relationship?”. For a couple of seconds there was total silence. My pastor noticed the tension in the room and tried to smooth over the awkwardness by quickly saying “that desire is a gift!” and they then moved on to prayer. I felt my whole body go hot. My first thought was “I hope she knows I didn’t mean to offend her”. And in the next breath I realized that I should also feel offended – I had unintentionally been single shamed. Simply put, single shaming is an occurrence (common in churches) where a single person is made to feel like there is something missing from their lives because they are not in a relationship. 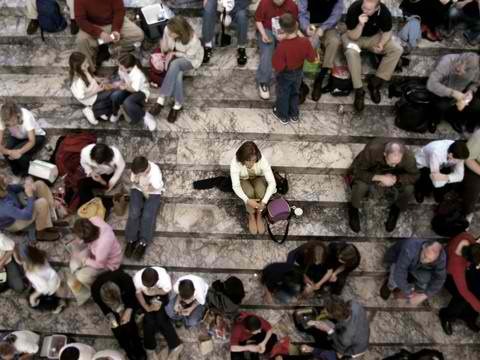 It implies that there is something wrong with singleness, or that it is merely a season that will soon pass. Always, marriage is heralded as the gold star or first place. Singleness is somehow reduced to a consolation prize. I am not going to discuss my own personal opinions on this – it would no doubt lead to misunderstandings. Instead let’s look at what the bible says about singleness (and marriage). 1. Your life is really not about being single or being married. I say this with all the love in the world…Jesus did not come to this earth so you could get married. Dying for our sins, he came to restore our relationship with (and reconcile us to) God. He empowers us through his Holy Spirit to love others as he loved us. To proclaim the good news. To reach the brokenhearted. To be salt and light in a broken world. Never have I heard it said that Jesus came so we could find “the one” (not a biblical concept by the way). 2. Being married doesn’t matter in the eternal perspective. Please don’t get me wrong. I don’t hate marriage at all! I think it is a wonderfully beautiful representation of God’s love for us while we are on this earth. But the bible says that at the resurrection “people will neither marry nor be given in marriage; they will be like the angels in heaven” (Matt 22:30). On judgment day God will not ask us whether we were single or married. Instead He will ask “did you feed Me?” “did you clothe Me?” (Matt 25:31-46). 4. Just because you desire something doesn’t mean that’s your gift. I’ve heard it said that if you truly truly desire marriage then you’re not meant to be a single. Where in the bible is that? And please don’t misquote the verse on God giving you the desires of your heart. Because otherwise half the female American population would be married to Brad Pitt. Psalm 37: 4 actually says “Take delight in the Lord, and He will give you the desires of your heart.” This means that you actually have to spend time with God, getting to know His heart and having your heart turn towards His. This means His desires become your desires. 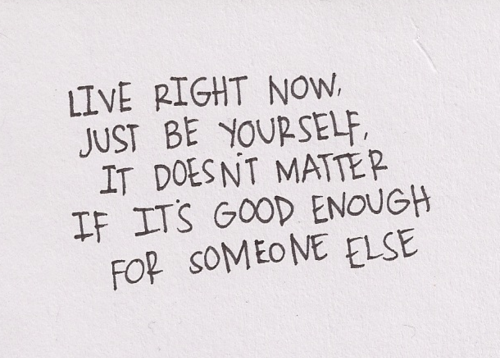 So take inventory. Is it really God speaking? Or is it your own heart? Ultimately it is impossible to really know if you have the gift of singleness until you die (as a single). It may be that your gift of marriage was reserved for much later in life. 5. Many of the figures in the Bible were single. Jesus himself was single. So was Paul. Elijah, Elisha, Jeremiah, John the Baptist, Mary Magdalene, and Lydia were all single. What makes marriage better than singleness (or vice-versa for that matter)? I have heard of churches that do not allow unmarried men to be pastors, elders, or deacons. So Jesus couldn’t be a pastor. Neither could Paul. Interesting. Again, I feel it is important for me to say I don’t hate marriage. If God were to bless me with a husband I would be extremely happy. But He may choose not to. I don’t think it’s wrong at all to pray for a partner. Or to spend time talking about singleness and marriage. These are both good things that should be talked about. There is much to learn from both camps. I maintain that I was truly blessed to listen to that couple’s testimony. I recognized how God was so present in their love story and how He has plans to use their testimony to glorify Him. My point in writing this entry is not to belittle marriage at all. Marriage is beautiful and a blessing and gift from God. My point is – let’s not forget that singleness is all of that too. My best friend recently bought me a book she had been trying to get me to read for a while now. 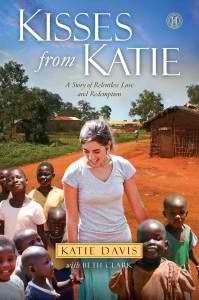 It’s called “Kisses from Katie” and it’s the story of an 18 year old girl that graduated high school, moved to Uganda, and adopted 14 kids. All by herself. All because God told her to. We agreed on reading a chapter a day and then discussing it over Voxer. I read the first chapter, cried my eyes out, and decided I had to share my reactions here. So for the next couple of weeks I will be blogging about this book, one chapter at a time. Quick Summary: Katie starts to realize the huge discrepancy between what she professes and how she lives. She talks about how she feels the need to actually DO SOMETHING. In an effort to be strategic, she starts by sponsoring school fees & supplies for two girls. This stokes a fire in her to find sponsors for more children, so they can attend school, get an education, and carve out a better life for themselves and their families. I was out driving yesterday and while waiting for the light to change a beggar-child came up to my window and knocked, asking for money. In the Philippines you’re never sure whether that child is begging on behalf of a syndicate, or to get a fix. But I wonder…does it matter? Is it so important for me to hold on to P5 just because I’m not sure where the money would be used? I truly don’t know the right answer. But what do I know for certain? I know I can be strategic. If I don’t want to give P5 to a street kid can’t I give that P5 to a home? To a feeding program? Can’t I give of myself? Can’t I spend a day or even half a day a week loving children? Loving the poor? Loving the unlovable? I am not rich…but surely I can do without P5 each day. Why am I like so many Christians that don’t do what God has commanded us to do – help the poor. 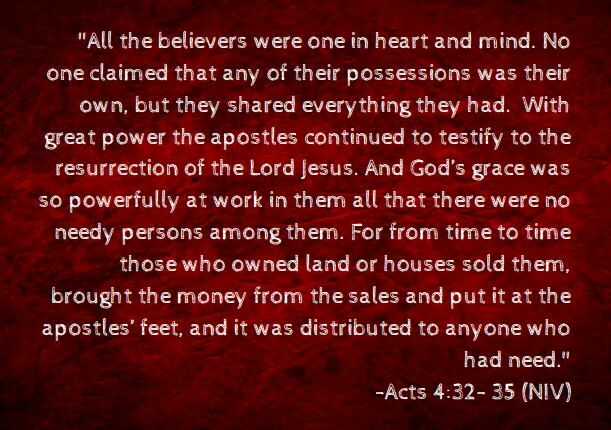 Share your belongings (Acts 2:44-45, 4:32-35). Leave something for the alien, the fatherless, and the widow (Deut 24:19-22). What am I doing?? I am not walking as Christ did. As a disciple and Christ-follower, I’m doing pretty shoddy work. Katie compares herself to “probably the worst disciple ever” – Peter, the rock on which God built His church. Thank God for His mercy and His grace. Thank God that even when He sees me failing to be kind, to be generous, to be Jesus to someone less fortunate than I, He still forgives me. He redeems me. He calls me back. He offers me chance after chance after chance. 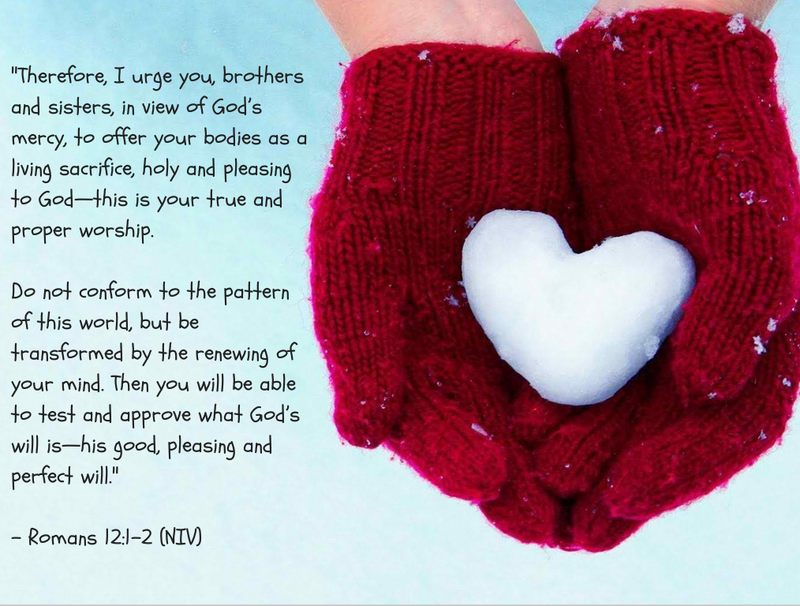 He promises to use me – broken, selfish, cold-hearted me. And He sees in me someone that is whole, generous, kind. Someone that is like Him. “When they had finished eating, Jesus said to Simon Peter, ‘Simon, son of John, do you truly love me more than these?’ ‘Yes, Lord,’ he said, ‘you know that I love you.’ Jesus said, ‘Feed my lambs.’” (John 21:15, NIV). Here’s my action plan: I’m going to be volunteering in some way. Before the month ends I want to have found a place that I can spend some money on and some time in. I want to practically help the needy. Check in with me on this, I would love to be accountable! And I would love it if whoever reads this would join me in reaching out, loving the needy, and being Jesus to them. To learn more about Katie and her ministry you can check out Katie’s blog here. an offering made with devotion. Quick Summary: Katie summarizes her first year in Uganda with the word “contradiction”. She talks about how battling with feelings of immeasurable happiness doing God’s work and loneliness for family, friends, and the familiar comforts of home. Embracing all the emotions as real and valid, at the end of the day though she wanted more than comfort. She wanted God. To dwell in His will for her life. Do you ever think there’s got to be more to life than this? Waking up, trudging halfheartedly to work, grabbing dinner, maybe watching a movie, going home, then doing it all again the next day? I do. For the past 3-4 years I have been thinking that perhaps I’m not doing what God designed me to do. It started as a thought that would pop up every now and then when things at work became a bit too difficult for me. Maybe this isn’t where I’m meant to be. Maybe this isn’t what I’m meant to do. Over time though, that inconstant niggling thought at the back of my head has turned into a loud persistent voice – showing up front and center. It is telling me there is more to life than this. More to life than serving myself and my needs. This life is not meant for my benefit. It’s meant to be lived on behalf of God. By loving others. Being Jesus to them. And doing that in such a way that is uniquely me. I don’t know that I am called to open an orphanage in Uganda. I don’t know that I’m called to be a light in a world of industry titans. That’s the problem. I just don’t know. I don’t know what my calling is. But maybe, finally, I’m ready to listen to that loud persistent, constant voice in my head. Perhaps now, now that the stubbornness has been replaced by this all-consuming discontent with how I’m living, I’ll be ready to follow where it leads. Quick Summary: Katie talks about the decision to do a short mission trip in Uganda while still in high school. She quickly realizes she’s meant to go back, for at least a year this time. After high school graduation she packs up and moves to Uganda for what she thought would be one year. I felt so ashamed to even read that. I am all too aware of dirt, of disease, of filth. I have been to a couple of orphanages. I live in a country where street kids are all too common. I used to think I was compassionate. But I read those words and realized my heart is evil. My heart doesn’t look at people covered in filth and realize that’s how I must look to God. My heart doesn’t say love them anyway, play with them, kiss them, hug them. I cringe. I stay away. I’m not being Jesus to people that really need Him. I started to cry while reading this. I am nearly 30 years old and I do not know how to live this way. A girl almost a decade younger is able to live this way. Why can’t I? The truth of it is that I am full of fear. I’m fearful that I’m not doing what God wants me to do. I’m afraid that what He wants me to do might be to live uncomfortably for the rest of my life. I’m afraid to step out in faith and change my life because I have no money to do so. I found myself thinking that if only I had the funds, I could take a year off and volunteer somewhere. But only if I had the resources to do so because I can’t imagine doing something crazy like that and not having the security of a hefty bank account to sustain me. I am trapped by my fears and burdened by my attachments. And I’m upset and angry. I’m upset to be confronted with my selfish, evil heart. I’m angry that I have come to this. I cannot reconcile the person I am with the person I desire to be. They are worlds apart and the realization sends me into despair. My prayer today was simple. Lord change my heart. Enable me to love people, truly love people, the way that You do. I realize that You may have been breaking me all this time to get me to a place of surrender to Your calling and plan for my life. But Lord, please, can’t you just change my heart and enable me, by Your grace, miraculously, to be the kind of person that would leave everything and bravely go forward doing what You want them to do? I’m emotionally exhausted just reading this first chapter. But I’m also cautiously hopeful. I am hoping that by the end of this book God will have given me a new heart, one that is ready to receive Him in any capacity.